I grew up on an island. It sounds exotic, but it was anything but. My island was a floating bridge away from Seattle and it was suburbia to the hilt. It was safe and scenic, but it was also boring. If you wanted to grocery shop, pick up your dry cleaning, eat bad Thai food, or check on your bank account, then you would never have had to leave the Island. If you wanted any other kind of services – restaurants, shopping of any kind, movie theatres, you know…culture – then you had to head over the bridge to Seattle. I’ve been on a bit of an ice cream making kick lately. Since discovering the wonder that is homemade, I have been making up for lost time with my ice cream maker. When I brought dinner to my friend with a newborn last week, the gnocchi and the broccoli, I decided to bring ice cream. I know I have said before that you must bring a nursing mother brownies. But that was before my ice cream making days and besides, it was too hot to turn on my oven that day. In all my years of subscribing to food magazines and dutifully cutting out recipes and carefully taping those recipes into my notebooks, I know I have thrown away many a recipe for ice cream. Before I got over my fear of using my maker, I just passed all those delicious recipes by. I don’t fret though because I have The Perfect Scoop which is, in my and many others much more esteemed than myself’s opinion, the last word when it comes to ice cream. I’m pretty simple with my ice cream tastes. Something with chocolate in it, please. However, as I go through this book, things that have never appealed to me suddenly sound good. Rum raisin? Sure, why not? Fresh Apricot? Let’s make it! So far, I’ve kept it pretty simple. This chocolate chip ice cream is tears-in-your-eyes sublime. It’s just super incredible vanilla ice cream with shards of bittersweet chocolate running through it. It’s a million times better than Baskin and Robbins. This recipe is fairly simple, but read it carefully as you go. The first time I made it, I followed it to the letter. The second time, I had too many things going on in my kitchen and I forgot to add the milk to the custard. Somehow, it still ended up being delicious. Believe it or not, Costco is a great place to buy vanilla beans – they are incredibly affordable and very high quality. Warm the milk, sugar, 1 cup of the cream, and salt in a medium saucepan. Scrape the seeds from the vanilla bean into the warm milk and add the bean as well. Cover, remove from the heat and let steep at room temperature for 30 minutes. Stir the mixture constantly over medium heat with a heatproof spatula, scraping the bottom as you stir, until the mixture thickens an coast the spatula. Pour the custard through the strainer and stir it into the cream. Put the vanilla bean into the custard, add the vanilla extract, and stir until cool over an ice bath. Chill the mixture thoroughly in the refrigerator. 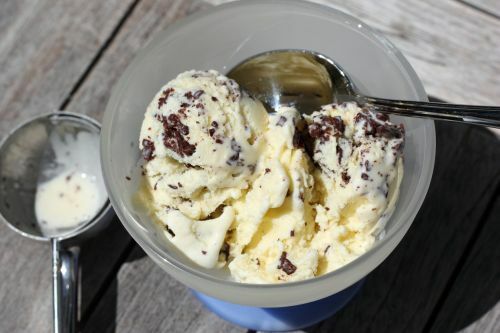 When ready to churn, remove the vanilla bean, rinsing and reserving it for another use, and then freeze the mixture in your ice cream maker according to the manufacturer’s instructions. Meanwhile, melt the chocolate in a measuring cup in the microwave in 30-second intervals. Remove from the microwave while there are still small chunks, the residual heat will melt those. Right before you are ready to turn off the ice cream maker, carefully pour the warm chocolate in through the spout, avoiding the beater blade as best you can. Turn off the machine and scrape any chocolate that has collected on the blade back into the bowl. Either serve or scrape into a container and place in the freezer. Oh wow, this looks rich and delicious (6 yolks!!). 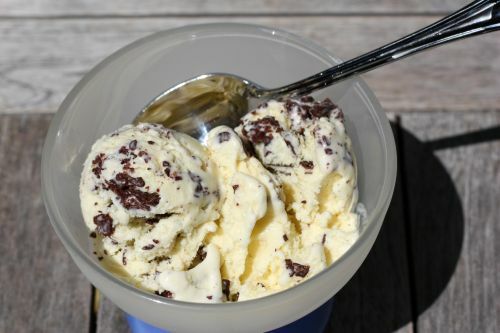 I once made a mint chocolate chip ice cream that was so good, but I’ll have to try just a plain ol’ chocolate chip. I love shaving/chopping the chocolate so much better than chocolate chips. What a dismal island life you had (kidding) :) Remind me to tell you about small-town, rural Oregon life – that’ll bring a tear to your eye! I LOVE that you’re into making ice creams – does your maker do sorbet and other variations, too? I’m growing more and more curious about one, as long as I can do low-fat, too. I really have to start making ice cream. Yours looks so creamy. 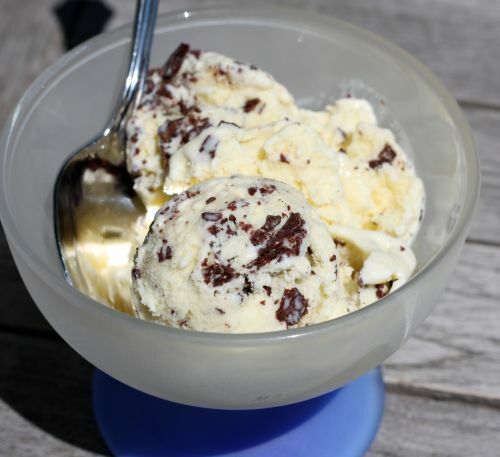 Nothing better than homemade ice cream. I have just recently discovered making ice cream myself, and I love it. This recipe sounds so delicious. Can’t go wrong with chocolate chips in frozen cream. Yum! The universe is conspiring to send me on a hunt for my buried-in-the-basement ice cream maker. Thanks for the inspiration. What is it with mothers and Jamocha Almond Fudge? That was my mum’s flavour, too. My sister and I preferred bubblegum, of course! This DOES sound sublime! I must, must try this recipe. I loved reading your post about family ice cream rituals. Funny thing is that mint chocolate chip was my favorite, and I NEVER ate it on a cone, always a bowl. I don’t know, though. Something about that flourescent green color kinda throws me off these days. As a child, I just thought the green was naturally the result of mint. In a quick fix, I do like Breyer’s chocolate mint, though. There are so many wonderful gems to unearth in Perfect Scoop, aren’t there? I am such a fan of Baskin Robbins! That is the only ice cream place we went when I was growing up and nothing, nothing will satisfy a BR craving other than BR. In fact, I made my boyfriend take me there last night for a big helping of chocolate fudge in a cup – no cone for me either! I also have a copy of The Perfect Scoop and have had such good luck with David’s recipes. This one looks delicious as well. In fact, you’re making me want to skip lunch and head back to BR. I’m feeling like too many days have slipped by since I last used my ice cream maker. And, I’m feeling very hungry for ice cream now! Mmm love mint chocolate chip ice cream! I prefer my ice cream in a bowl too though I really love waffle cones. But I’d rather eat the waffle cone by itself and then the ice cream in a bowl. That ice cream looks sinfully delicious. Great photographs too!